Costa Rica’s natural beauty makes it the perfect place to rejuvenate your mind, body, and spirit! 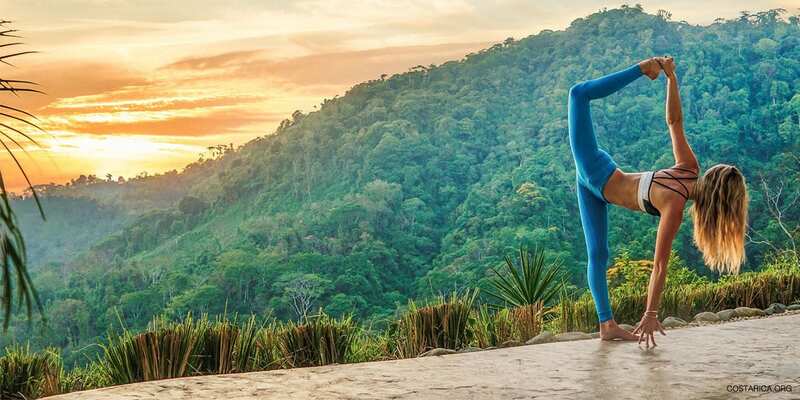 Find peace and serenity with Yoga Costa Rica Packages introducing high-end ecolodges dedicated to promoting sustainable tourism and conservation. Choose from a wide variety of beach and mountain resorts that offer daily yoga classes and retreats in a pristine natural setting. Costa Rica also offers some spectacular spas where you can relax and enjoy a massage, facial or treatment after a day of exploring the country. Medical tourism is also becoming more popular and more and more people are coming to Costa Rica to get dental work or surgery done while visiting this natural paradise. Healthy food and an active lifestyle is an integral part of living in Costa Rica. You’ll be amazed by the genuine friendliness of the people you encounter during your travels. Go back home feeling like a million dollars after one of our Yoga Costa Rica packages. Visit one of these rainforest retreats, eco-lodges, and spas! Have a look! Perhaps you don’t immediately associate Costa Rica with yoga given its reputation as the adventure capital with stunning rainforests, beaches and volcanoes. But this setting is ideal for those looking to be more at home with themselves. Costa Rica has put itself on the map as a yoga destination and it is the perfect place for you to meet like-minded people as well as join a top-notch yoga studio, indulge in a full-service spa and take a variety of stress releasing tours like hiking through the lush jungle and national park, horseback riding on the beach. Experience Costa Rica with a clean body and a clean mind! Practicing yoga next to a beautiful waterfall or on the top of an amazing mountain range while enjoying a variety of spa treatments is bound to have a positive effect on you. Nosara on the Nicoya Peninsula is one of the most famous places in Costa Rica to practice yoga. On top of the list is the Bodhi Tree Yoga Resort. Next to yoga classes, you will also be able to follow a teacher training course that can turn you into a yoga instructor yourself! Yoga is more than just bending in a few poses to feel relaxed. It is a lifestyle that aims for a more holistic approach. Healthy meals to promote a healthy body, guided meditations to promote that healthy mind and Costa Rica’s lush surroundings to help the process along. The Bodhi Tree Yoga retreat is located in Nosara. Nicoya is famed for being one of the Blue Zones of the world celebrating a life focused on health, happiness and longevity. In short, the perfect location for your yoga vacation! They offer community as well as private yoga classes as well as full scale yoga retreats, guided meditations, trainings and workshops and surfing retreats. Bodhi Tree also boasts a pilates studio, a gym, a spa and indoor cycling. The yoga classes you can take at Bodhi tree include Hatha & Meditation, Free Style, Vinyasa, Surf Yoga, Slow flow, Mindfulness yoga, Yin, Restorative and Sunset Yin. Other fitness classes include belly dancing, Tai Chi, restorative yoga, kids yoga, Power yoga, Aerial fit, Yogalates, Latin dance and Core explore. For that extra bit of relaxation, visit the stunning infinity pool during some morning yoga and watch the sunrise. The accommodations are built to support the guests in the Zen sensation the classes are looking to promote. In your spare time, explore the rest of the Peninsula and head to the town of Nicoya to learn about Costa Rica’s history and experience the everyday pure life in Costa Rica. The Caribbean side can not be forgotten in this list! Next to having some of the most lush and green jungle areas in the country, the area of Puerto Viejo also boasts a Costa Rica Yoga Spa. Contrary to Nosara and the Nicoya Peninsula, Puerto Viejo mixes different cultural influences and sits on 250 acres of rainforest. Making it the perfect destination for those looking to take plenty of time for themselves and lose themselves in the natural surroundings. This yoga retreat is small and only a little while removed from the beach. Other than the yoga deck with lush jungle and ocean views, Samasati offers an on-site restaurant and massage service. Organic meals are prepared daily for the guests. Enjoy vegetarian meals and completely release your body of all toxins. Promote the natural functions of your body by having several small meals a day rather than three big ones and feel the benefits. Samasati is the retreat that perfectly balances a sustainable mission with a spiritual as well as physical cleansing. How many nights would you like to stay in this relaxing wonderland? The Pranamar Villas Yoga Retreatl is located in Santa Teresa at the very tip of the Nicoya Peninsula. They offer top quality yoga classes for guests every day at 10am. They also offer full yoga retreats. If you’re interested in surfing, Playa Santa Teresa is a well known surfing beach. Hotel amenities include a restaurant offering healthy meals, a yoga studio, a swimming pool, different kinds of spa treatments and massages.